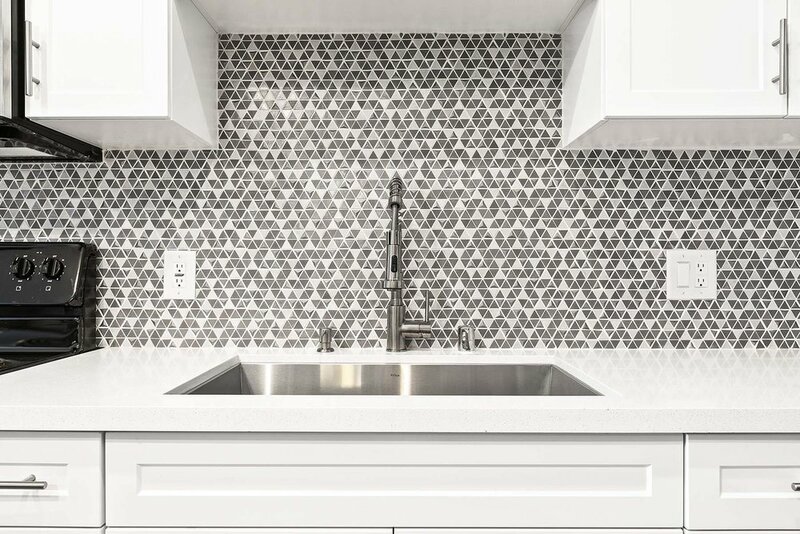 This Playa Vista condo's kitchen and two bathrooms were transformed into modern and bright spaces with unique tile choices and functional design. The master bathroom features a new shower area where there was once a bath tub, and included unique porcelain wall and floor tiles from Spazio LA Tile Gallery, a floating bench and custom frameless shower door. Floating shelves above the toilet of both bathrooms added extra storage space. 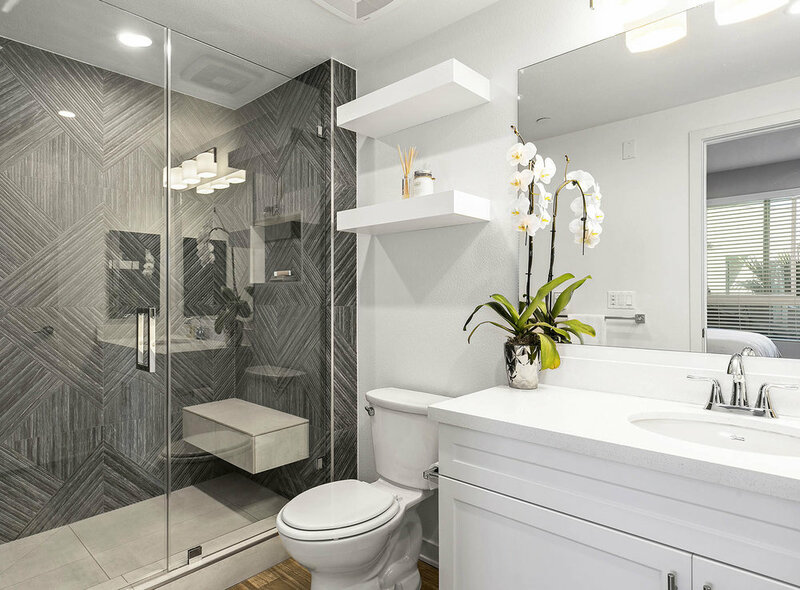 The guest bathroom features new patterned porcelain tiles on walls and custom glass shower doors. For the kitchen, a new larger sink was created, and a mosaic 3D backsplash added a beautiful focal point. Click below for all the details and before photos. Master bathroom featuring Noa-L Vancouver porcelain wall tiles and porcelain floor tiles, both from Spazio LA Tile Gallery, custom frameless shower door, floating bench, new floating shelves above toiled and Ferguson plumbing fixtures. Guest bathroom featuring Firenze Deco Cenere porcelain wall tiles from Spazio LA Tile Gallery, new tub, custom frameless shower door, new shelves above toiled and Ferguson plumbing fixtures. New sink, fixtures and backsplash with Art Berlin mosaic tiles from Spazio LA Tile Gallery.